Inc.; Chazz Palminteri, writer, director, producer and Academy Award-nominated actor; and Donna M. Rapaccioli Ph.D., dean of the Gabelli School of Business and dean of the business faculty at Fordham University. The NIAF gala begins with a cocktail reception at 6:30 p.m., followed by an awards program, live auction and dinner. 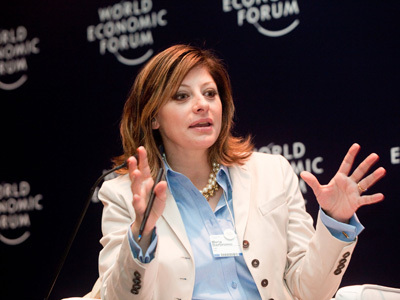 During the gala, before 500 guests, the Foundation will honor Bartiromo with the NIAF Special Achievement Award in Broadcasting/Media, and Certosimo with its Special Achievement Award in Business. NIAF’s Special Achievement Award in Financial Management will be awarded to D’Amelio and its Special Achievement Award in Education will be awarded to Rapaccioli. Palminteri will receive the Foundation’s Lifetime Achievement Award in Entertainment. He was also a recipient of a NIAF Special Achievement Award in the Performing Arts during the Foundation’s 21st Anniversary Awards Gala in 1996 in our nation’s capital. Bartiromo is anchor of CNBC’s “Closing Bell with Maria Bartiromo,” and anchor and managing editor of the nationally syndicated “Wall Street Journal Report with Maria Bartiromo,” recently rated the most watched financial news program in America. She writes for many financial columns, has authored several books, and has received numerous awards, including two Emmys. In addition to her involvement with NIAF, she sits on the boards of New York University, the Columbus Citizens Foundation, the New York City Ballet and the Girl Scout Council of New York. Certosimo is member of both the Executive and Operating Committees of BNY Mellon and CEO of Global Markets, leading the company’s foreign exchange, capital markets and derivatives trading businesses worldwide. He also oversees BNY Mellon Clearing LLC. Prior to his current role, he served as CEO of Alternative, Broker-Dealer and Treasury Services. He is a member of the Board of Directors of DTCC, vice chair and board member of the Promontory Interfinancial Network, the International Derivatives Clearing Group and CMET Finance Holdings. He also serves on numerous committees dedicated to delivering actionable solutions to issues facing the financial services industry. As an executive of Pfizer Inc., D’Amelio is responsible for finance, business operations including IT, procurement and real estate, and global manufacturing. Before joining Pfizer in 2007, he was senior executive vice president of Integration and chief administrative officer of Alcatel-Lucent. In 2005, 2006, 2011 and 2012, D’Amelio was ranked among America’s top CFOs by Institutional Investor magazine. In 2002, he was selected one of the top 10 leaders in his field by Treasury & Risk Management magazine. He also serves on the Board of Directors of Humana Inc., the Independent College Fund of New Jersey and the JPMorgan Chase National Advisory Board. Appearing twice on Broadway in ”A Bronx Tale,” Palminteri’s recently sold-out engagement parallels his Broadway debut 23 years ago in the same play. His portfolio includes more than 50 movies, among them, “The Usual Suspects,” “Bullets Over Broadway,” “Analyze This,” “Hurlyburly,” “Mulholland Falls,” “Faithful,” “Poolhall Junkies,” “The Perez Family,” “Jade,” “Diabolique,” “Down to Earth” and “A Guide to Recognizing Your Saints.” He also directed the HBO series “Oz” (episode, “Unnatural Disasters”), Showtime’s “Women vs. Men,” and the feature film “Noel,” starring Susan Sarandon, Penelope Cruz, Robin Williams and Paul Walker. He was also seen on the New York stage in the play “The Resistible Rise of Arturo Ui,” starring with Al Pacino, John Goodman, Steve Buscemi and Billy Crudup. He is a member of the Actors Studio in New York City. In addition to her responsibilities as dean of the Gabelli School of Business and dean of the business faculty at Fordham University, Rapaccioli holds the rank of University Professor. She also serves on the Board of Trustees of Emmanuel College in Boston and is a member of the Advisory Board for the International Association of Jesuit Business Schools. She serves on the Board of Directors of Fordham University’s London Centre, the Steering Committee for Fordham’s Consortium for Social Justice, and the Board of Advisors of the Fordham Corporate Law Center. She has consulted for and lectured on accounting and finance topics at numerous financial institutions in New York City, and serves as a director on the board of GE Asset Management Mutual Funds. The event is chaired by Gerard S. LaRocca, NIAF Board Member and chief administrative officer, Americas, Barclays Capital. The mistress of ceremonies for the evening will be Hon. Patricia de Stacy Harrison, NIAF Vice Chair and President and CEO for the Corporation for Public Broadcasting. The gala also includes performances by famed Italo-Australian singer ALFIO and Pia Toscano, a former American Idol contestant, who released her hit single, “This Time,” last July.